As part of the Conversation Series, I’ll be speaking with certain contributors about certain movies at certain times. Zach Schonfeld is a “writer” living in “Brooklyn.” He is currently a reporter for Newsweek Magazine and studied English and American Studies at Wesleyan University, for which we’re all very proud. We spoke at length about Oliver Stone’s 1991 masterpiece, JFK. Sam Sklar: What’s going on man! SS: I’m glad we’re finally able to do this…this is a cool thing…thanks for taking the time. ZS: Um, yeah. Well Oliver Stone described it as a counter-myth to the myth of the Warren Report, which I find really interesting because he’s sort of acknowledging that his film doesn’t tell any sort of objective truth because there can be no objective truth because probably the only people who know what happened to JFK are dead. So in that sense he is constructing Jim Garrison’s version of the truth – which in many ways i diametrically opposed to what the Warren Report came out with. And so, the film has been attacked because it validates some of the most extreme and radical conspiracy theories associated with the Kennedy assassination but I think that was Oliver Stone’s goal, really. SS: I think so, too. I think that he would have…there would have been no success in his eyes had he tried to construct a straight biography from that point on November 22nd, 1963 to the months and years that followed. There is no biography there to tell that hasn’t already been told. His goal in making this movie was to draw attention, maybe turn some heads and kind of get his message across, which may or may not be truthful, so I think that — what was the author’s name of that piece? SS: Linda Williams…there was a little, well the writing was a little dense. ZS: Oh yeah, it was very dense. SS: She attempted a lot of six-syllable words when she could have used simpler ones, but I understood her point and it’s a theme that has kept coming up in all the reading and all the movies that I’ve watched and the critiques that I’ve read, this concept of, “Is there a bigger picture?” and within the bigger picture, how can the details be interpreted. So within this world that Stone created, at what point are we to believe, “what is true? Is there such a thing as objective truth and did Stone even attempt to search for it or was his goal, like you said, the counter-myth…was that the point. Does it matter, then the criticism he’s received? ZS: I don’t really think that truth is obtainable and I don’t know if he [Stone] viewed it as, “Oh, I’m going get at the total truth of the assassination. I think his goal was to show things from the point of view of Jim Garrison and Roger Ebert also wrote some interesting things about the movie. Roger Ebert liked it a lot and he wrote that Oliver Stone does not subscribe to all of Jim Garrison’s crack-pot theories but, he writes, he [Stone] uses Garrison as a symbolic center of the film because Garrison, in all the United States, in the years since 1963, is the only man who has attempted to bring anyone into court in connection with the fishiest political murder of our time. I think that’s something that’s easy to forget; the main character of the movie is not JFK, it’s Jim Garrison. That’s something that’s very, very clear as you’re watching it. We never actually see JFK speak, really, we never view him as a living, breathing character. Jim Garrison is our anchor into the entire plot. He is the only person ever to have prosecuted someone in connection with JFK’s murder. And for that reason, he’s the most important character in the movie. SS: So, I guess the question is, I would want to sum up from all this is, “why are people deriding this movie?” Is it because they were expecting a biography of JFK and will do anything to keep that truth in their mind or are they diametrically opposed to his methodology or blinding dislike it regardless of the message he [Stone] was trying to send. Where is this derision coming from? ZS: It’s been a little while since I read that entire Linda Williams piece, but I remember that she takes issue with how much he manipulates the evidence to support Jim Garrison’s argument and his prosecution instead of embracing the fact that there are multiple truths – basically infinite truths and versions of the truth of what could have happened. And, it very, very much supports conspiracy theorists in the ways in which it manipulates the evidence and I think a lot of people took issue with that and argued that it’s ahistorical and he went too far to validate these views. SS: Right, right. 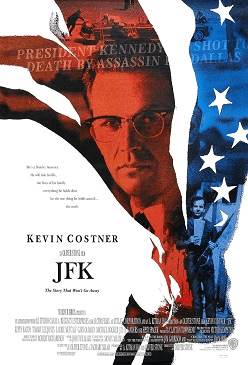 I mean, so do you think people were expecting more of a biopic and the expectation is built up and we see the letters “JFK” on the screen, I wouldn’t necessarily, if I had not known anything about Oliver Stone, if I had not known anything about Jim Garrison or any of these theories…. You know it’s funny I was writing some notes down as I was watching the movie and here are the eight words I decided to write down because I decided to do this from memory and summary at that point. I wrote “war machine and gay agenda…obsessed like Zodiac killer.” I don’t know what that means, but I guess what I was trying to go for is that Oliver Stone really propped up the concept of this whole homosexual underground network…I feel like he made a very big deal out of the fact that the characters were all homosexual and I’m not sure where he was going with that except that he was trying to rile up some kind of grouping of these men. Does their [Willie O’Keefe, Clay Shaw, Lee Harvey Oswald] sexuality play into the way they went about the theory [that JFK was set up. Watch the movie – ed.] is the question I’m getting at. ZS: And I think that the movie was made 24 or 25 years ago [Actually, 23 years ago – ed.] and is a very, very, very long time in the grand sprawl of gay rights and it [the movie] takes place almost 50 years ago at a time when to be part of an underground homosexual community basically means to be part of a criminal community. Those two things were basically seen as synonymous because, you know, “normal, law-abiding Americans,” didn’t have gay relations (or they did and they didn’t talk about them or we didn’t know about them). SS: Right, so I guess that immediately struck me as something very peculiar in the way that the script was written, that there could have been an entire script written, and I guess that concept of “what is objective truth?” where you don’t know the sexual orientations or the provocations of any of these men and it may have had a different outcome on how the audience viewed it then, it may have had an outcome on how we view it today and it may have even had an outcome on how it was prosecuted during the trials, X number of years after the fact. So I thought that was an interesting concept. And I guess I had just seen Zodiac at that point for the first time, about the Zodiac killer. SS: This was a couple of weeks ago when I watched the movie…and I remember I was on an airplane coming back from Europe and I watched Zodiac and I got this motif of this obsession that can consume some men and Jake Gyllenhaal’s character, who gets consumed and blindly obsessed with who the Zodiac killer is. Do you think that he [Jim Garrison] was more driven by the human need to solve something rather than actually trying to expose anybody for wrongdoing? Or do you think that it was only a small part of his personality and that he actually felt patriotism or some kind of respect for the office of the president. Do you know what I’m trying to get at here? ZS: Yeah, and I think that obsessive drive was a key part of his character. The movie very much stresses the fact that he’s neglecting his family in the course of this prosecution. That’s a very key motif. He’s so obsessed with this [the murder of JFK] that he stops taking care of his kids and his wife. Also, the character acting is very strong and vivid as far as the whole Clay Shaw being gay thing. Tommy Lee Jones’ performance and Joe Pesce’s performance. They’re very, very over the top in a way that makes it very gripping, like really vivid, southern, flamboyant rich dudes, you know? They’re very sleazy and that sleaziness is very key to what Jim Garrison is standing up to.